Deborah Bennett is coordinating the August guild meeting. 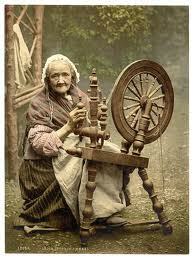 We will be having a spinning wheel show and tell. If you have an antique, unusual or notable spinning wheel, please consider bringing it to the Woodside church fellowship hall on Aug 16 for our monthly guild meeting. Spinning wheels do not have to be in spinnable working condition, although it is more fun if they are! If you are bringing a wheel in August, would you please send Deborah an email (degb@alumni.rice.edu) with some information about your wheel. Information could include its age, general type, how it came to you (bought it, inherited it), whether it is in working condition, what you like to spin on it, what it spins well, etc. If it is an antique whether you know the maker or where it was made, any initials or engraving on it, etc. I would like to present a summary of the wheels at the beginning of the meeting, and perhaps group them by type in the hall.